Workplace Insanity: Be Careful What You Wish For! We’ve all heard the fairy tales where a person finds a magic lantern, rubs it, and a magic genie comes out and grants that person three wishes. Sometimes they work, and sometimes they come out horribly wrong. In the movie Bedazzled, the hero is offered seven wishes by the Devil in exchange for his soul. This was a classic and hilarious example of how one’s wishes can come true, but in horribly wrong ways. When the hero wishes to be rich and powerful, he wakes up a Columbian drug lord, rich and powerful, but beset by troubles on every side. When he wishes to be sympathetic and sensitive, he wakes up a sniveling, spineless wimp. And so it continues through all of his wishes. As the saying goes, be careful what you wish for! Life in the corporate world can operate in a similar fashion where unintended consequences of getting what you wish for frequently occur, despite or as a result of the good intentions you may have had. The road to hell is paved with good intentions (and the unintended consequences of those good intentions)! Long ago, during my days at Bell Labs, I was involved in a project that was in deep trouble. My management, trying to help, decided to add a lot more people to the project. This was their wish, not mine, and was meant to “help” me. My plaintive wail to them at the time was that I felt like a drowning man who had just been thrown … an anchor! All of those new people had to be educated on the product and project and brought up to speed, and had to communicate frequently with those already on the project. The people who had to provide the education and communicate frequently with them were the people currently involved in developing the product, preventing them from effectively continuing the development. The natural, but unintended, consequence was that the project was delayed significantly further than it would have been if we had not received the added “help”. It fit perfectly into Brooks Law [from The Mythical Man-Month: Essays on Software Engineering, by Frederick P. Brooks, Jr., © 1975 by Addison-Wesley Publishing Company, Inc., page 25], which states, “Adding manpower to a late software project will make it later.”] Ultimately and happily, the product we released (late) was a strong success, but this experience was a great illustration of the unintended consequences of good intentions! The result could have easily gone badly. [See also Too Many Cooks Spoil The Broth!]. How else can wishing for something “good” become your worst nightmare? You may wish for more time to complete a complex product or program development and even convince your boss to give you that time, only to find that by missing a critical launch date you have lost significant market share to your competition. It may be that fewer features, but an on-time market launch, with feature enhancements over time would have been a far more successful approach. Be careful what you wish for! You may be frustrated that the product or program development process in your organization is too “loosey-goosey” and crave a more structured process to bring some sanity into the process. Conversely, you may be frustrated that there is far too much process and that you spend most of your time satisfying the process rather than getting the product or program developed. [see also Methodology: Too Little, Too Much, or “Just Right”?] Embarking on changes to the methodology to make things “just right” for your organization may be noble and necessary and just what your organization needs, but you need to go into this effort with your eyes wide open. Don’t think that this will be a simple or painless process. You will uncover all kinds of surprises along the way that will require a lot more work to correct or incorporate into your new process. And once the Pandora’s Box of changing the methodology process is opened, it is often difficult or impossible to close it. Be careful what you wish for! You may wish for more data in order to make well-informed decisions rather than taking a shot in the dark based on less data and instinct. However, if you are granted your wish to get more data you may learn that it will take significant time, that you don't have, to gather that data, and that you will end up so overwhelmed with data that you end up having an even harder time making an informed decision. Conversely, you may feel you’re drowning in data and unable to make a decision due to “analysis paralysis”, and wish to simply decide on something, or anything, only to find that deciding too early leads to the wrong decisions. Be careful what you wish for! You may wish to bring in another organization with some specific expertise to help with the decision making process only to find that once they get involved they effectively take over (the proverbial camel’s nose under the tent). Conversely, you may wish to block another organization from getting involved because you want to protect your turf, only to learn that this other organization had precisely the expertise you needed and that you missed your commitments due to their lack of involvement. Be careful what you wish for! You may believe that if only you had more or better equipment or software, your group’s productivity would soar. However, if you are granted your wish, you may find that you and others must now spend a lot of your time learning how to use that new equipment or software. This can take precious time away from actually doing the work necessary to get the job done. New equipment or software may be great to have over the long run, but we all live in the here and now. The best time to get new equipment or software is when you have the time to learn how to use it without impacting the project you are currently on, not during crunch time. Be careful what you wish for! I’m sure you can come up with any number of further examples where getting your wishes can and often does backfire (see also If You Want It Bad, You’ll Get It … Bad!). This is not to say that you should not desire things you don’t have or not express your desires. However, it does say that you need to carefully think through not only the intended consequences of getting these wishes, but also the unintended consequences. The unintended consequences can often be far worse than the intended consequences are better. 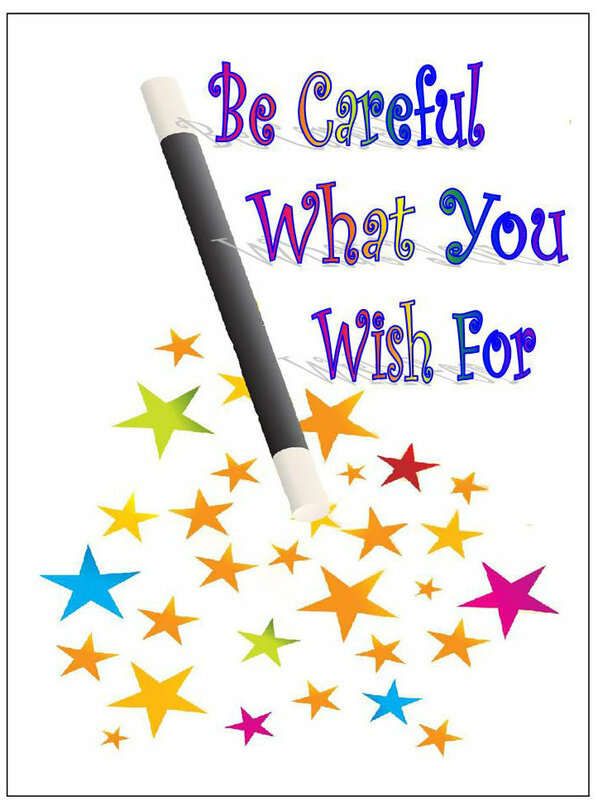 Be careful what you wish for!